Recently I’ve shared reviews of a number of books that I’ve read for my local book club. This month, the club is doing something a little different-we’re reading graphic novels. I know many of my long-time readers may wonder why a grown woman, with grown children, would choose to read what essentially is perceived to be a comic book. The truth is that graphic novels have come a long way, to the point they are actually considered a sophisticated art form. While some graphic novels are still collections of a series of comic books that go together to form a longer story, bound into a book format, that definition no longer encompasses the whole usage of the term. 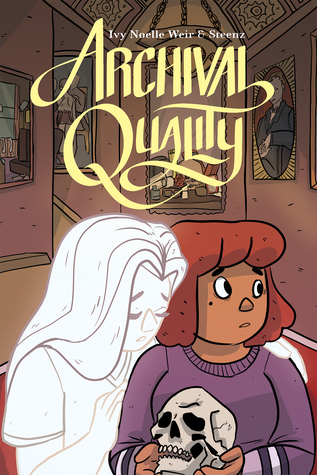 Many graphic novels are refined works, sometimes retellings of existing novels or sometimes new, independent stories, where illustrations play at least an equally important part to the text. Though some are designed with children in mind, many graphic novels often include more mature or darker themes than would generally be expected to be found in comic books, and can contain any type of subject matter, from fiction to non-fiction. The challenge set for my book club specifically is reading graphic novels with paranormal themes. Since some of these are shorter than regular novels, I decided to review a few of them together in one post. This is just a small sample of what can be found in your local bookstore, comic shop, library, or online. This original story found exclusively in graphic novel format features a young woman who has suffered a nervous breakdown, resulting in the loss of her beloved job as a library assistant. Anxious to put her life back together, Cel answers an ad for an archivist position at The Logan Museum of Medical Oddities. From the very first, she finds her new job full of surprises. She is required to live in an apartment inside the library building, because she is expected to do her work at night. Her boss has a habit of appearing and disappearing at the most inopportune times. Cel begins having dreams of a young woman who was tortured in the building, which at one time housed an asylum. Then she begins suffering mysterious nosebleeds and losing time. What is happening to Cel, and how does it relate to the mysteries of the museum? Was the woman a patient at the asylum, and why is the only record of her a picture found misfiled in the archive? How is the board, whom none of the employees ever see, involved? While I sympathized with the main character, Cel, and was drawn into the mystery, many of the other characters seemed annoying or unnecessary to the storyline. Cel was the only one fully developed, while the others, such as her boss Holly and boyfriend Kyle seemed to be used more as plot devices to move the action along than as actual individuals important to the plot. The artwork was fluid and enhanced the tone and scope of the novel, despite the “comic” nature of the characters. If this story was produced in another format, I would say it would make a good short story or novella, perhaps in a collection of horror stories. Overall, I give it three stars. Author Jim Butcher has augmented his popular novel series, The Dresden Files, with a set of graphic novels. While some of these are retellings of other books in the series, Ghoul Goblin, #3, co-written by Mark Powers, is an original addition to the Dresden universe. Consisting of a set of six comics bound into one volume, this beautifully illustrated story is as detailed as any of the author’s novels. Deputy Sheriff Prescott “Pres” Tremaine travels to The Windy City to hire Harry Dresden, wizard for hire, to investigate events that have unfolded in his small Missouri town. A family of seven orphans, the Talbots, has been devastated with the deaths of their two eldest under mysterious circumstances. Dresden recognizes the handiwork of supernatural forces in the crime scene photos, and agrees to investigate. Arriving just in time for the funeral of the two Talbots, Harry runs afoul of both the remaining Talbots, led by the skeptical eldest remaining brother and the town sheriff, who refuses to believe anything out of the ordinary is at play, even when the undertaker, who turns out to be a goblin in disguise, attacks. Despite being warned away, Dresden begins his investigation that soon shows there is more than one supernatural presence in the small town. The Talbots are under a curse, one which draws the residents of the Nevernever to them like flies to honey, and now two separate creatures are competing for territory, and the right to see who can end their line first. The only thing this graphic novel has in common with comic books was the fact that each page was covered in artwork, but the quality far outweighed the illustrations of any comic I read as a kid. From the very first page, where Harry is fighting a water demon in Lake Michigan the reader is drawn into a world where the supernatural lives alongside our own. The characters were well-developed, with the depth and attention to detail I’ve come to expect from Butcher. The story, while containing less text than usual for the author’s work, nevertheless was just as complete and riveting as any I’ve read in this universe, and easily fit inside the chronology as a case for Harry Dresden. 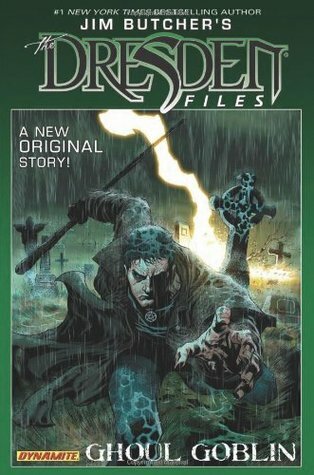 I award this graphic novel five stars and would recommend it to anyone interested in The Dresden Files novels, paranormal or thriller stories, or just dipping their toes into the world of graphic novels. 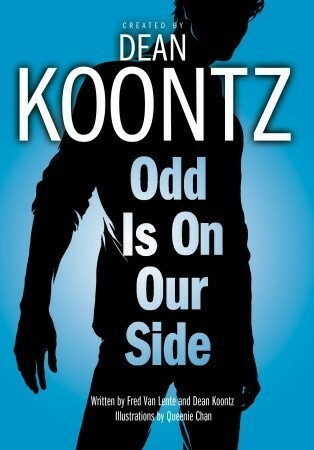 In Odd is on Our Side, Odd Thomas, a character from Koontz’s series of novels, sees dead people and tries to assist them in crossing over. This graphic novel features a Halloween celebration in Odd’s native Pico Mundo, CA. Odd, with the help of his girlfriend Stormy, investigates when Odd begins seeing bodachs, ominous heralds of death, creeping around town. In a plot that is one part Sixth Sense and one part Scooby Doo, Odd follows clues that leads him on a wild goose chase after devil-mask wearing teens stealing jack-o-lanterns to toss downhill for the annual Pumpkin Roll, to a young costume-wearing ghost, and into the history of the man who poisoned the town’s trick-or-treaters twenty-five years earlier. In the end, Odd and his friends find that the true danger comes not from the supernatural, but a criminal in disguise, and only they have the means and the knowledge to save the town. Despite a full cast of quirky characters, including resident eccentric novelist Ozzie Boone, his editor Valerie Malovent, and the helpful shade of Elvis Presley, this story is mostly plot-driven, with numerous twists and turns that kept me on my toes yet all came together in the end. The illustrations were all done in black and white, and while not as detailed as in some other graphic novels I’ve read, conveyed the action well and were an integral part of the story. In fact, some pages were wholly or mostly artwork, but still carried the weight of the tale. This was a very enjoyable story that I thought did very well in this format and I award it four and a half stars, and recommend it to fans of the paranormal as well as fans of Dean Koontz’s works.